Until fairly recently, I didn’t know about bresaola. Well I knew about it but never thought that I might be missing out by not eating it. Now I think… what madness overtook me? All those years of missing out on wonderfully thin slices of salted air-dried beef. What was I thinking?! Bresaola is not that easy to find. I get mine at a delicatessen at the Victoria market but I tried during the week at a couple of the local delis. They shook their head and offered capocollo or prosciutto…. “but they’re pork not beef” I muttered to myself, walking out of the shop. 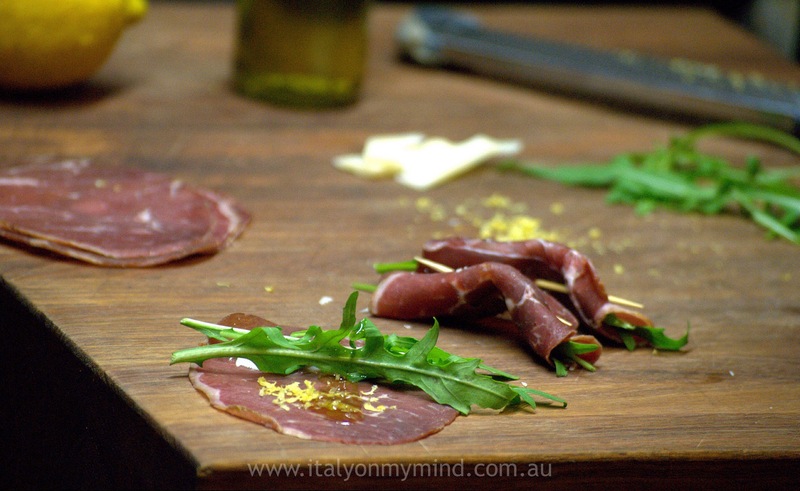 Interestingly I found a recipe for how to make your own bresaola at home through the SBS website – the link is here. I might give that a try one day since it is so hard to find and it doesn’t seem too complex to make (and a relative short curing time). The flavours that work well with bresaola are parmigiano, lemon and rocket. Looking through the beautifully photographed “Polpo – A Venetian cookbook (of sorts)” by Russell Norman a few weeks back, I found this recipe for some cicheti (Venetian small plates to have with a drink) that had these very same ingredients. So I have been making these a LOT and eating them with an aperitif (usually an Aperol Spritz or with my current obsession, a Negroni) making up for not having eaten bresaola for the first half of my life! Lay out the slices of bresaola, putting several rocket leaves, a shaving of Parmesan and a good pinch of lemon zest on each. Fold/roll each slice of bresaola (securing with a toothpick if you like) and drizzle on some EVOO. These can be made several hours ahead and kept covered in the fridge. Bresaola is amazing! I bought some Spring St Grocer before and it was one of the most delicious beef I have tasted. so glad to hear you are a convert to Bresaola Felicia! Bresaola is one of my very favorite salumi, also because it makes for a nice change as one of the few that’s not made from pork. I had a salad with just those ingredients in Padua a few years ago. So wonderful. My husband (the mad scientist) tried making his own bresaola a few years ago. It didn’t work out so well. Hope you fare better! Looks like just what I want to serve my friends when they come to supper next week! Luckily we have some good bresaola that I brought back (vacuum-packed specially by the shopkeeper) from our holiday home in Corinaldo. I hope I can make it look as nice as yours. 2015 edition ready last night (use the SBS Gourmet Farmer recipe). Put in the time and find a “safe” place to hang for a few weeks in winter and you cannot go wrong. As I am working I am looking out to the arugula in the garden and thinking of the parmesan in the fridge. I think I have dinner nailed.